Tuscany, Italy is one of the regions (administratively "Regione") of the central part of Italy and includes the provinces of Arezzo, Florence, Grosseto, Livorno, Massa, Carrara, Pisa and Sienna. Its geomorphology is highly characteristic, with its northern boundary being formed by the Apennines and the outliers known as the Apuan Alps, and its main area dominated by the valley of the Arno, the headwaters of the Tiber, and the valleys of the streams running into these rivers. Indeed, the smaller administrative areas of the region can be grouped as the valleys of Tuscany, despite almost all of the ancient populated nuclei being hill towns. Tuscany has an area of 9304 sq. miles. and its territory is essentially the same as that of ancient Etruria. 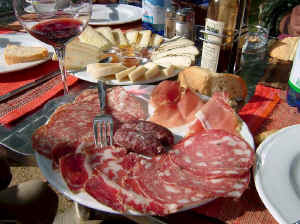 Click here to view a map of the provinces of Tuscany. Tuscany is a land of hill towns defined by its valleys. The valleys of Tuscany were and still are the routes that formed Tuscany - armies, merchants, pilgrims and scholars have passed along them for the past two thousand years to form Tuscany as we know it today. In the 6 C and 5 C BC., the Etruscans were the dominant power in northern and central Italy, and brought Latium and Rome under their suzerainty. Towards the end of the 6 C BC, Rome regained its independence and from the second half of the 5 C BC it began a struggle for supremacy. There were many changes of fortune during the long war, but it ended in about 280 BC with the overthrow of Etruria. In the Roman Empire, Etruria formed the seventh region of Italy. After the fall of the Western Empire, Tuscany was ruled successively by the Germans under Odoacer, by the Ostrogoths, by the Eastern Empire through Narses and by the Lombards. Tuscany, or Tuscia as it was called in the Middle Ages, became a part of the Frankish Empire during the reign of Charlemagne and was designated a margravate, the margrave of which was also made the ruler of the Duchy of Spoleto and Camerino several times. In 1030, the margravate fell to Boniface, of the Canossa family. Boniface was also Duke of Spoleto, Count of Modena, Mantua and Ferrara, and was the most powerful prince of the empire in Italy. He was followed by his wife Beatrice, first as regent for their minor son who died in 1055, then as regent for their daughter Matilda. In 1076, Beatrice died. Both she and her daughter were enthusiastic adherents of Pope Gregory VII in his contest with the empire, and after Matilda's death in 1115 her hereditary possessions were for long an object of strife between the papacy and the emperors. More about Roman remains in Umbria. For your visit to Tuscany, stay in self-catering accommodations with a swimming pool in the Chianti Classico wine zone. Villas, farm apartments, B&B rooms, country hotels. Click here for beautiful vacation rentals. During the years 1139-45, Tuscany was ruled by Margrave Hulderich, who was appointed by the Emperor Conrad III. Hulderich was followed by Guelf, brother of Henry the Lion. In 1195, the Emperor Henry VI gave the margravate in fief to his brother Philip. In 12O9, Otto IV renounced all claim to Matilda's lands in favour of the papacy, as did also the Emperor Frederick II in the Golden Bull of Eger of 1213, but both firmly maintained the rights of the empire in the Tuscan cities. During the struggle between the popes and the emperors and in the period following the fall of the Hohenstaufens when the throne was vacant, Florence, Sienna, Pisa, Lucca, Arezzo, and other Tuscan cities attained constantly increasing independence and autonomy. 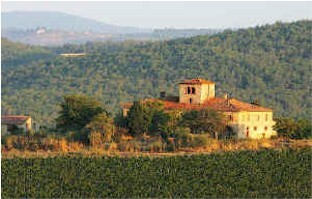 They also acquired control of Matilda's patrimony, so far as it was situated in Tuscany. In the 14 C and 15 C all Tuscany, except Siena and Lucca, came under the suzerainty of Florence and the Medici. In 1523, the Emperor Charles V made Alessandro Medici hereditary Duke of Florence. The last Tuscan towns that still enjoyed independence were acquired by Alessandro's successor Cosimo I (1537-74) partly by cunning and bribery, partly with Spanish aid by force of arms. In 1557 Philip II, who required Cosimo's aid against the pope, granted him Siena which in 1555 had surrendered to the emperor. Only a small part of Siennese territory remained Spanish as the Stato degli Presidi. Thus the Medici acquired the whole of Tuscany, and in 1569 the pope made Cosimo Grand Duke of Tuscany. Although at the beginning of Cosimo's reign there were several conspiracies, especially by the exiled families, the Fuorisciti, the Florentines gradually became accustomed to the absolute government of the ruler. Cosimo had created a well-ordered state out of the chaos existing previously, and had established this state on the foundation of justice, equality of all citizens, good financial administration and sufficient military strength. Art, literature and learning also enjoyed a new era of prosperity during his reign. After long negotiations, in 1576 his son Francesco I (1574-87) received from the Emperor Maximilian the confirmation of the grand ducal title which had been refused to his father. In his foreign policy, Francesco was dependent on the Habsburg dynasty. During his weak reign the power was in the hands of women and favourites, and the corruption of the nobility and officials gained ground again, while the discontent of the common people was increased by heavy taxes. After the death of his first wife the grand duke married his mistress, the Venetian Bianca Capello. As he had only daughters, one of whom was the French queen, Maria de Medici, and the attempt to substitute an illegitimate son failed, he was followed by his brother Cardinal Ferdinand (1587-1605), who has been accused, without any sound evidence (although refer to the description of the Medici manuscript), of poisoning his brother and sister-in-law. In foreign policy Ferdinand made himself independent of the emperor and of Spain and as an opponent of the preponderance of the Habsburgs supported the French King Henry IV. Henry's return to the Catholic Church was largely due to Ferdinand's influence. Ferdinand benefited his duchy by an excellent administration and large public works, such as the draining of the Mianatales and the Maremma of Siena, the construction of the port of Leghorn (Livorno), and many other projects. He re-established public safety by repressing brigandage. In 1589, he resigned the cardinalate, with the consent of Sixtus V, and married Christine, daughter of Henry III of France. His relations with the papacy were almost always of the best. He promoted the reform of the Tuscan monasteries and the execution of the decrees of the Council of Trent. His son Cosimo II (1609-21) married Margareta, sister of the Emperor Ferdinand II. Cosimo II ruled in the same spirit as his father and raised the prosperity of the country to a height never before attained. He was succeeded by a minor son of eleven years, Ferdinand II (1621-70), the regent being the boy's mother. Margareta's weakness led to the loss of Tuscany's right to the Duchy of Urbino, which fell vacant, and which Pope Urban VII took as an unoccupied fief of the Church. From 1628 Ferdinand ruled independently. To the disadvantage of his country, he formed a close union with the Habsburg dynasty which involved him in a number of Italian wars. These wars, together with plague, were disastrous to Tuscany. Cosimo III (1670-1723) brought the country to the brink of ruin by his unlucky policy and his extravagance. His autocratic methods, inconsistency and preposterous measures in internal affairs place upon him the greater part of the responsibility for the extreme arbitrariness that developed among the state officials, especially among those of the judiciary. Although he sought to increase the importance of the Church, he damaged it by using the clergy for police purposes, proceeded against heretics with undue severity, and sought to aid the conversion of non-Catholics and Jews by all means, even very material ones. During the War of the Spanish Succession, the Grand Duke desired to remain neutral, although he had accepted Siena in fief once more from Philip V. During this period, Tuscany was ravaged by plague and the war taxes and forced contributions levied on it by the imperial generals completely destroyed its prosperity. Neither of Cosimo's two sons had male heirs, and consequently he obstinately pursued the plan, although without success, to transfer the succession to his daughter. Before this, however, the powers had agreed in the Peace of Utrecht that when the Medici were extinct, the succession to Tuscany was to fall to the Spanish Bourbons. Cosimo III was followed by his second son Giovan Gastone (1723-37), who permitted the country to be governed by his unscrupulous chamberlain, Giuliano Dami. When he died the Medici dynasty ended. A great many interesting details of the activities of the Medici dynasty are described in a manuscript of 785 pages entitled Istoria della Case De Medici, written in large part by 1720 in the last years of Cosimo III. This ms. is preserved in the library of your webmaster and will be transcribed to this site as time permits. In accordance with the Treaty of Vienna of 1735, Francis, Duke of Lorraine, who had married Maria Theresa in 1736, became Grand Duke (1737-65) in place of the Spanish Bourbons. Francis Joseph garrisoned the country with Austrian troops and transferred its administration to imperial councilors. As Tuscany now became an Austrian territory, belonging as inheritance to the second son, Tuscany was more or less dependent upon Vienna. However, the country once more greatly advanced in economic prosperity, especially during the reign of Leopold I (1765-90), who, like his brother the Emperor Joseph I, was full of zeal for reform, but who went about it more slowly and cautiously. In 1782 Leopold suppressed the Inquisition, reduced the possessions of the Church, suppressed numerous monasteries, and interfered in purely internal ecclesiastical matters for the benefit of the Jansenists. After his election as emperor he was succeeded in 1790 by his second son, Ferdinand III, who ruled as his father had done. During the French Revolution, Ferdinand lost his duchy in 1789 and 1800. It was given to Duke Louis of Parma on 1 October, under the name of the Kingdom of Etruria. In 1807 Tuscany was united directly with the French Empire and Napoleon made his sister, Eliza Bacciocchi, its administrator, with the title of Grand Duchess. After Napoleon's overthrow, the Congress of Vienna gave Tuscany to Ferdinand once more and added to it Elba, Piombino, and the Stato degli Presidi. A number of the monasteries suppressed by the French were re-established by the Concordat of 1815 but otherwise the government was influenced by the principles of Josephinism in its relations with the Catholic Church. When the efforts of the Italian secret societies for the formation of a united national state spread to Tuscany, Ferdinand formed a closer union with Austria and the Tuscan troops were placed under Austrian officers in preparation for the outbreak of war. The administration of his son Leopold II (1824-60) was long considered the most liberal in Italy, although he reigned as an absolute sovereign. The Concordat of 1850 also gave the Church greater liberty. Notwithstanding the economic and intellectual growth that Tuscany enjoyed, the intrigues of the secret societies found the country fruitful soil, for the rulers were always regarded as foreigners and the connection they formed with Austria made them unpopular. In 1847, a state council was established and on 15 Feb. 1848, a constitution was issued. Notwithstanding this, the sedition against the dynasty increased and in August there were street fights at Leghorn in which the troops proved unreliable. Although Leopold had called a democratic ministry in October, with Guerrazzi and Montanelli at its head, and had taken part in the Piedmontese war against Austria, the Republicans nevertheless forced him to flee from the country and go to Gaeta in Feb. 1849. A provisional republican government was established in Florence, but before long this was forced to give way to an opposing movement of moderate Liberalism. After this and with the aid of Austria, in July 1849 Leopold was able to return. In 1852, he suppressed the constitution issued in 1848 and governed as an absolute ruler, although with caution and moderation. However, the suppression of the constitution and the fact that up to 1855 an Austrian army of occupation remained in the country made him greatly disliked. When, in 1859, war broke out between Sardinia-Piedmont and Austria, and Leopold became the confederate of Austria, a fresh revolution erupted and forced him to leave. For the duration of the war, Victor Emmanuel occupied the country. After the Peace of Villa Franca had restored Tuscany to Leopold, the latter abdicated in favour of his son Ferdinand IV. On 16 Aug. 1859, a national assembly declared the deposition of the dynasty, and a second assembly on 12 March, 1860 voted for annexation to Piedmont, and this was officially proclaimed on 22 March. 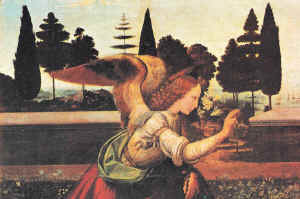 Since then Tuscany has been a part of Italy, the capital of which was Florence from 1865 to 1871. 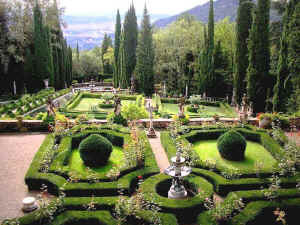 Click the link for a range of excellent Bed and Breakfast in Chianti accommodation options. Tuscany Toscana © ammonet InfoTech 2005- 2018. All rights reserved.